We have a great number of personal files stored in our Samsung Galaxy. Sometimes, data lose in seconds for many kinds of reasons and we have no idea what to do with it. Commonly, accidental deletion causes data loss. Here the questions come up - Will the data be deleted permanently? Is it possible to recover deleted folder from Samsung? If you lost data without backup your Samsung device, you can use professional software mentioned in Part 1 and Part 2 to recover deleted folder. A special situation which involves data recovery from broken Samsung is mentioned in Part 3. However, if you have backed up your Samsung before data loss, you can try free apps mentioned in Part 4 to recover files from backups. When you perform a deletion on your Samsung phone, the files will not be deleted at once until new data is written to cover the original one. Hence, you should not use your phone in order to keep it in the original state. You can turn off the Wi-Fi/ mobile data network to avoid automatic update and protect the memory card from physical damage. If the space of deleted data is overwritten, you may not retrieve your lost files anymore. Part 1. How to Recover Deleted Folder from Samsung with Samsung Data Recovery (Root Required)? Part 2. 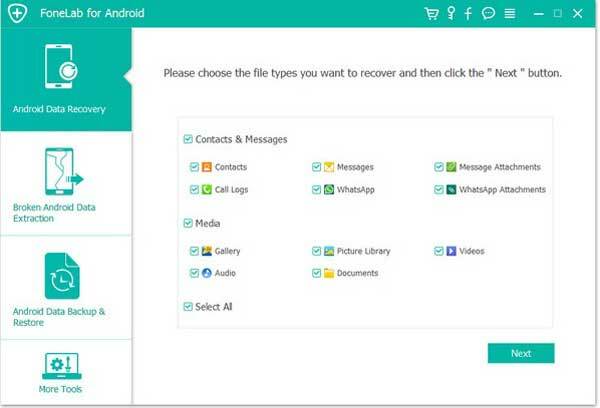 How to Recover Deleted Folder from Samsung with Android Data Recovery (without Root)? Part 3. How to Recover Files from Broken Samsung? Samsung uses SD card or memory card to store media files like photos, music and videos. If you like to recover media files from SD card after losing data by accident, Samsung Data Recovery can do a favor. You can use this professional software to retrieve Samsung deleted files from SD card without root. However, unlike media data, Samsung stores the most important personal info in internal storage & SIM card. These files include contacts, call logs and messages are totally sensitive. You can use Samsung Data Recovery to recover these files after rooting your Samsung device. 1. Retrieve music, videos and pictures from SD card without loss. 2. 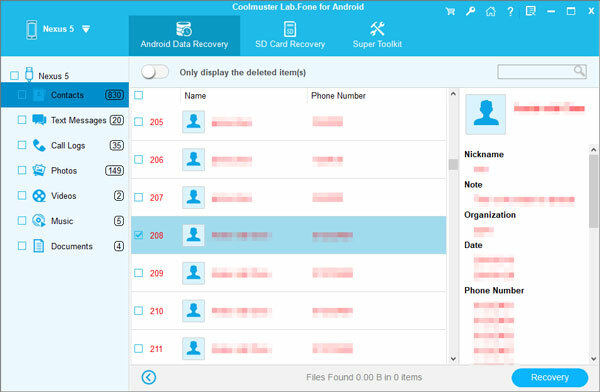 Restore call logs, contacts and text messages from internal storage and SIM card. 3. Preview recoverable files on PC before recovery. Please download and install the correct version of Samsung Data Recovery, here are two free trials for Windows/ Mac. Step 1: Go to "Android SD Card Recovery" on the top menu, you can see an interface as below. Here, please insert the SD card to your computer at first. Step 2. Click "Next" and all the inserted SD cards in your computer will be shown here. Just pick one you would like to scan, and click "Next" to start the scanning. Step 3. After the scanning is finished, all the recoverable files are listed on the left panel, including Photos, Videos, Audio and Documents. The deleted items are marked in red. You can now select the items you want to restore, click "Recover" button to save them on your computer. Step 1. 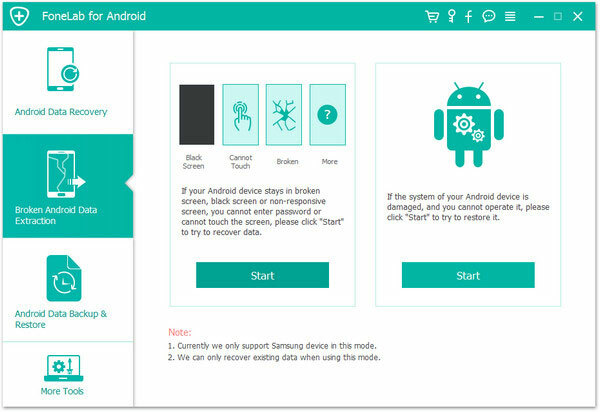 You can launch the program and connect your Samsung to computer via a USB cable under the "Android Data Recovery" mode. 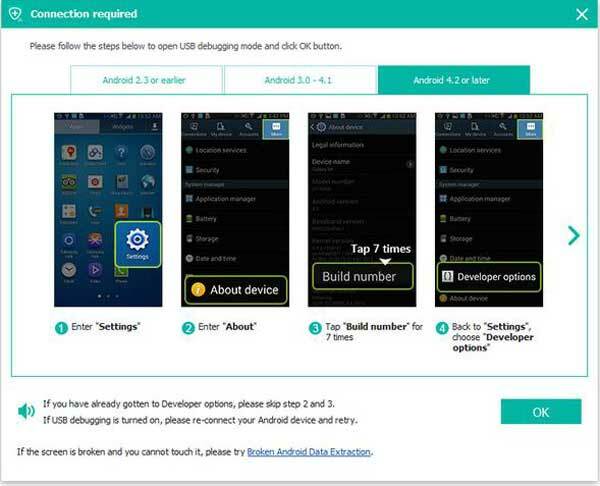 You need to enable USB debugging on your Samsung. Once your device is detected, you enter the main interface. Step 2. Click "Next", you can see all the recoverable files which are sorted in the folders on the left panel. If you go to "Contacts" folder, you can select the deleted contacts (marked in red) to restore to computer. You can preview and choose items in this way to get them back. The program supports Samsung Galaxy S9+/ S9/ S8+/ S8/ S7/ S6/ S5, Samsung Galaxy Note9/ Note8/ Note7/ Note6/ Note5/ Note4, Samsung Galaxy A9/ A8/ A7/ A6 and other Android brands, such as Xiaomi, Huawei, HTC, LG, etc. 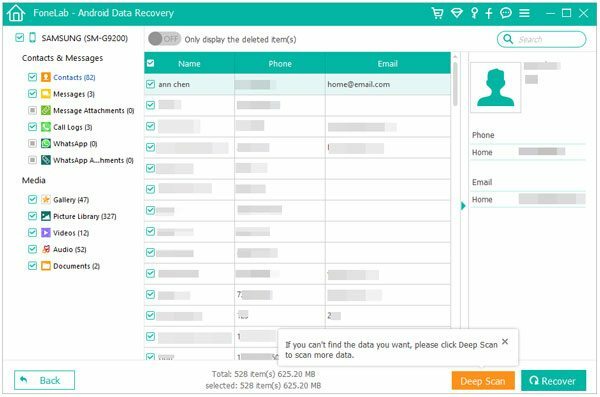 If you do not want to root your Samsung phone, you can choose Android Data Recovery to recover Samsung deleted folder without backup. With it, you can restore data from SD card, internal memory and SIM card (subscription needed). It supports contacts, messages, call logs, music, videos, photos, documents, WhatsApp messages and its attachments. Step 2. Launch the program and connect your Samsung device to computer via a USB cable. Please enable USB debugging on your Samsung phone as the guidance on the interface. Step 3. 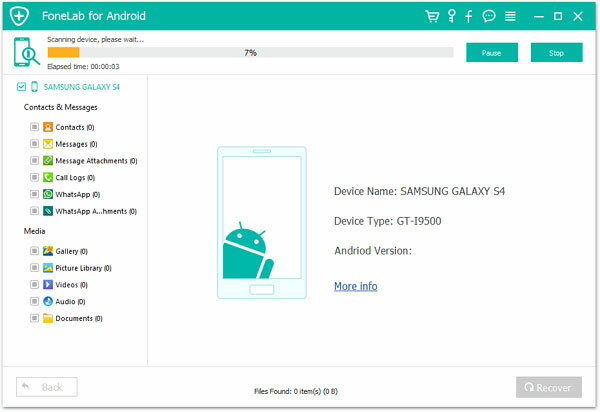 When Samsung device is detected, the program will scan your phone automatically and display all recoverable files on the interface. You can select "WhatsApp" or other folders selectively or wholly, then click "Next" to preview the data. Step 4. Select the items you wish to retrieve to computer, tap on "Recover" to export them to local folder. The program supports Samsung Galaxy S9+/ S9/ S8+/ S8/ S7/ S6/ S5, Samsung Galaxy Note8/ Note7/ Note6/ Note5/ Note4, Samsung Galaxy A9/ A8/ A7/ A6 and other Android brands, such as Xiaomo, Huawei, HTC, LG, etc. Sometimes, operating system crash may cause a black screen with data loss accidentally. You may encounter a problem about how to recover files from broken Samsung. Broken Android Data Extraction is a professional software for data recovery from broken Android. It really does a great favor to recover files before saving from broken Samsung. It can rescue the data, like call logs, contacts, text messages, messages attachments, WhatsApp and its attachments, pictures, videos, music and other formats of files, from internal storage and SD card. Notice: The program only supports Samsung Galaxy Note 5/ Note 4/ Note 3/ S6/ S5/ S4/ Tab Pro 10.1 and so on at present. More technical supports for other Android devices will be developed soon. Step 1. Please download the free trial of Broken Android Data Extraction on your computer, here are two versions for Windows/ Mac. Step 3. 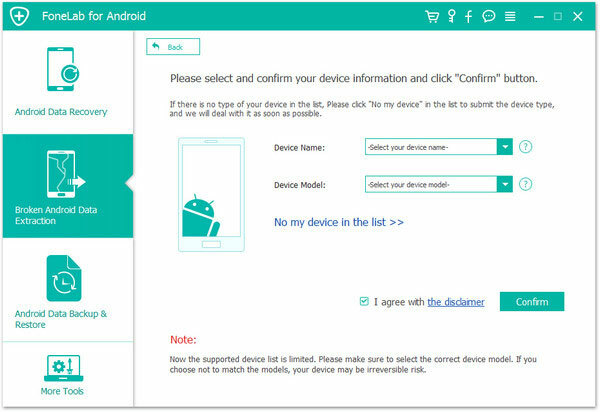 Once your phone is detected successfully, please click "Broken Android Data Extraction", select your device name and device model from the drop-down menu, click "Confirm" to go on. Step 4. 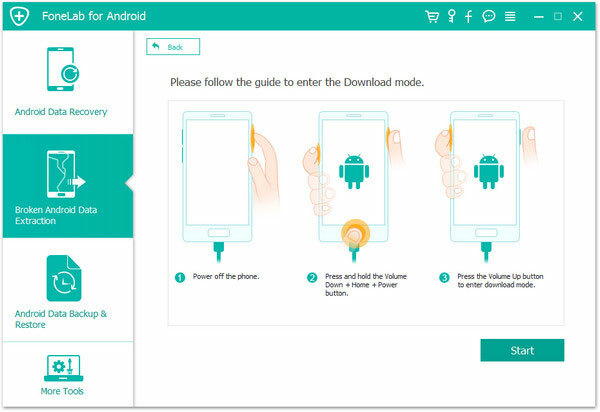 Please follow the interface prompts to enter the Download mode, click "Start" to access your Samsung phone. Step 5. The program will scan your whole phone to capture a listing of recoverable files on the interface as shown below. You can now select the files you wish to get back, click "Recover" button to extract them from broken Samsung and save them readable on computer. It is good for you to backup your Samsung frequently at daily time, because you never know when the data will be lost by accident. If you used to backup your Samsung device before the accidental data loss, you can recover files from backups. 1. 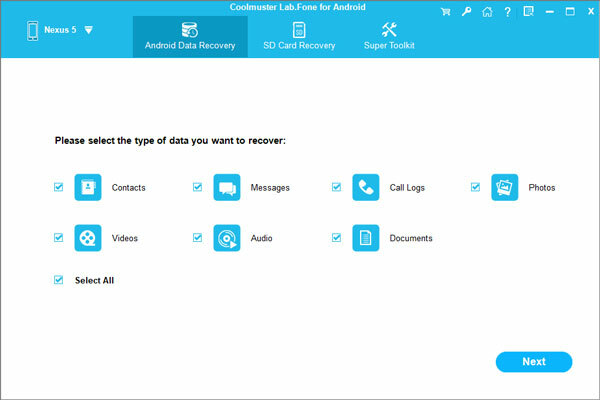 You can restore data from Samsung Cloud directly on your phone. 2. Download the backups from Google Drive. 3. Find your lost files back with an Android recycle bin - Dumpster. We can hardly prevent data loss in many unexpected situations, such as accidental deletion, operating system crash, water infusion and so on. It is really a need to backup your phone at daily time. Many apps for you can help backup and restore files. Or you can always backup and restore your phone in a professional way with Android data backup tool - Samsung Messages Backup. Deleted Folder Recovery - How to Recover Deleted Folder on Android?